The world of email clients is becoming exciting again. That’s thanks to Kube, an effort born out of the KDE world, and specifically the Kolab and RoundCube projects. You may wonder why I pay attention to this initiative; after all, I now use Emacs’ mu4e for about two thirds of my email processing and handling. But the importance of email clients is both underestimated by many while remaining a large stumbling block to lift vendor lock-in and achieving software freedom for emails, contacts and calendaring. While I do use Emacs for a large part of my email processing because I’m productive with it, I do get that most people will not be be switching to emacs or mutt ever. In fact I’m happy when people are not thinking that their emails are “fine, because they’re on GMail”. Many people do not understand the difference between an email provider, an email client and a webmail. So when I look at the first screenshots of Kube, I see something that looks ten times better than *anything out there* . Including Outlook, Apple Mail, Evolution, Thunderbird, Claws, etc. See for yourself here. I think a beautiful interface matters a lot. While it’s not the only email client to do it, it is developed from the onset to offer email processing, contacts & file management, calendaring and other groupware niceties. One potential benefit is that users no longer need to worry about using something else: it’s all in the box so to speak. This may not be obvious but how many email clients (open source or proprietary) today can claim to be even remotely recent? To the best of my knowledge, none does. It does not mean existing clients are bad at what they do, but it is refreshing to see such an effort being started from the ground: it signals a potential to address new kinds of needs and use cases from the beginning. Let’s face it: there’s little innovation happening in this field not because there’s no need but because change can quickly become costly when it comes to personal information management tools. If Kube delivers on the majority of its promises, it has the potential to extend beyond the Linux desktop and become one of the major alternatives to the established proprietary solutions. This is an intriguing prospect, and one that has a strong positive potential. I wish the best to the Kube project and I hope it will succeed: we need them! 4 Responses to "Discovering the Kube project"
What make you think it’s open source? The license is “TBD” in the project readme in git. you’re right that there does not seem to be a license yet. 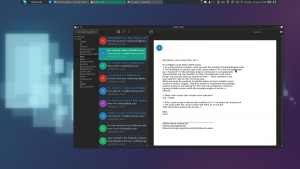 However the project itself is hosted on the KDE repos/forge. I hardly imagine proprietary software being hosted there.